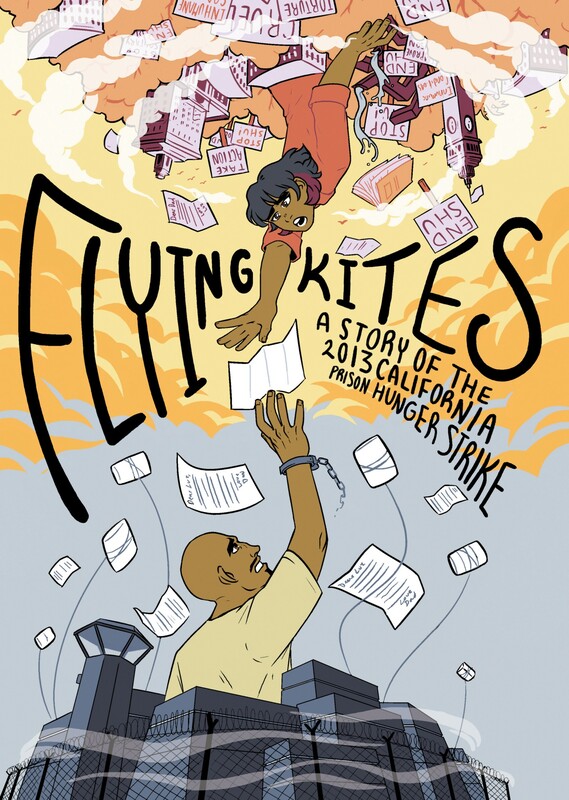 Cover image of “Flying Kites: A Story of the 2013 California Prison Hunger Strike,” a book by the students and teachers of the Stanford Graphic Novel Project. Cover by Lucy Zhu. I’ve always loved comic books. I’m a photographer but, truth be told, I think comics have always been my favorite medium to consume. For me, they’re pure magic. When the time elapsed between two panels on a page can be a moment or a decade, and when all styles of writing and visual art can be molded to fit this single form, the storytelling possibilities feel limitless. And unlike photojournalism, you can meet someone and tell their story even if you’ve missed key moments from their past. Often lost in the crowd amongst the superhero stories, there is a rich tradition of journalistic, nonfiction, and memoir comic books. I love comics, but I never believed that I could create them. 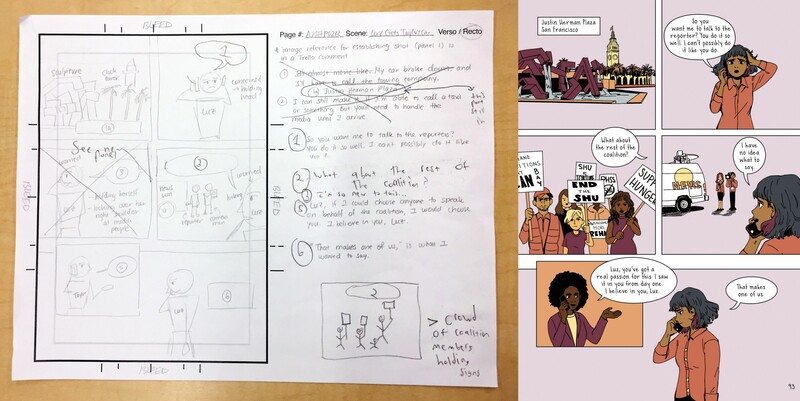 Students and teachers in the Stanford Graphic Novel Project 2018–2019 class. The class is offered every other year, so we were lucky that it happened during our fellowship year at Stanford. 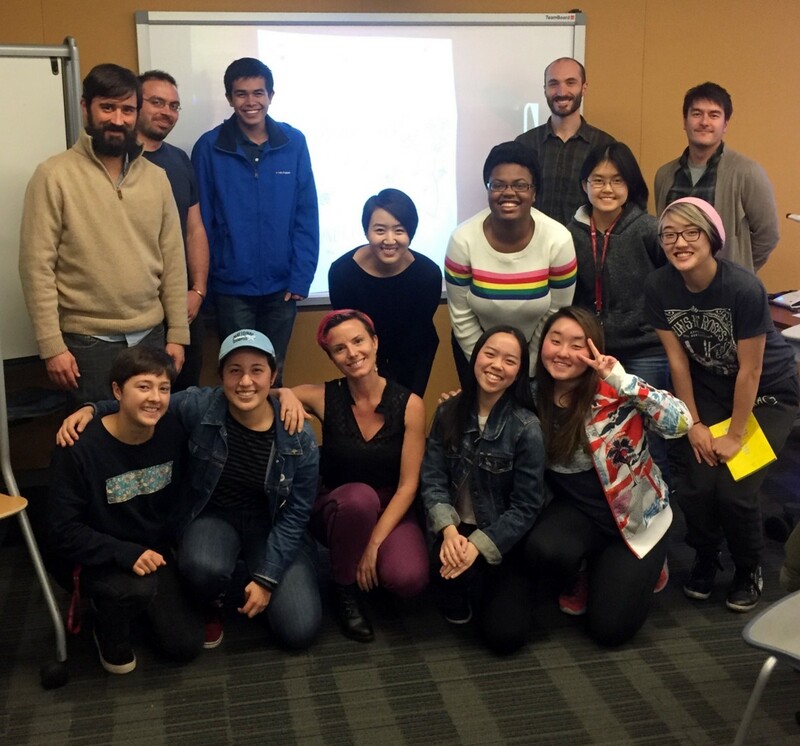 This year, the class was made up of 11 students (with studies ranging from medicine to computer science to, of course, journalism), three instructors, and two teaching assistants. We’ve been working collectively to create one “based on a true story” graphic novel, published at the end of the class. (Ours is almost finished, and I can’t’ wait to hold it in my hands in April!) It will be the 8th graphic novel produced over the years by students in this collaborative class. After a pitching and voting process, we settled on the subject of our book: the 2013 California prison hunger strike, a landmark event in the fight for prisoner rights and the abolition of indefinite solitary confinement. More than 30,000 prisoners refused to eat, some of them for 58 straight days. The class felt this was an important story with lasting impact, and we wanted to bring more attention to it. We were also interested in the visual challenges and possibilities. 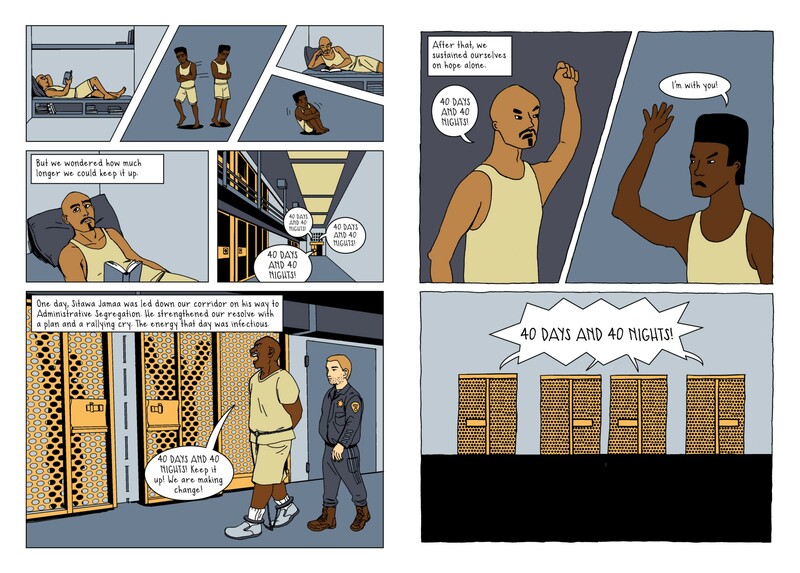 A book that takes place largely in prison runs of the risk of becoming visually repetitive, but we were excited to come up with some creative solutions as we experimented with the medium. It was also vital to our work that Sarah has been reporting on this topic for more than nine years, so we knew we would benefit greatly from having an expert in the room. She has conducted more than 75 interviews with prisoners in isolation and drew on that material to co-author an anthology of stories, “Hell is A Very Small Place,” and write a play, The Box, a journalistic piece of investigative theater on the same hunger strike our class is focused on. The play premiered in San Francisco in 2016 and will be performed on Alcatraz Island this June. 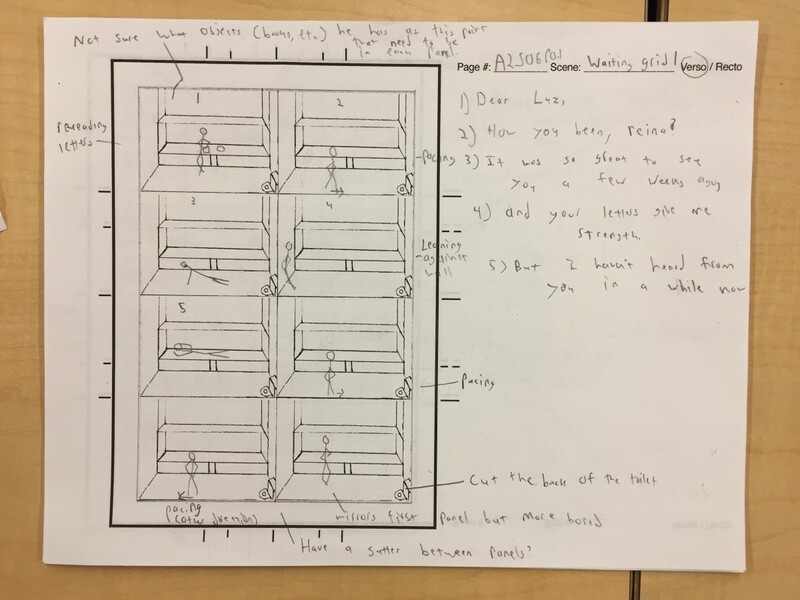 Some of our scenes were drawn directly from Sarah’s reporting, and she was able to check every aspect of our work for accuracy, weighing in on whether dialogue, the inner workings of prisons life, and the events of the prison strike were realistic. Our class started with background research, reading countless articles about the strike and some of Sarah’s interviews and letters with prisoners. We decided to tell the story through a composite character, Rodrigo Santiago, a mid-level gang member in the solitary housing unit at Pelican Bay Prison in Crescent City, California, about 20 miles south of the Oregon border. 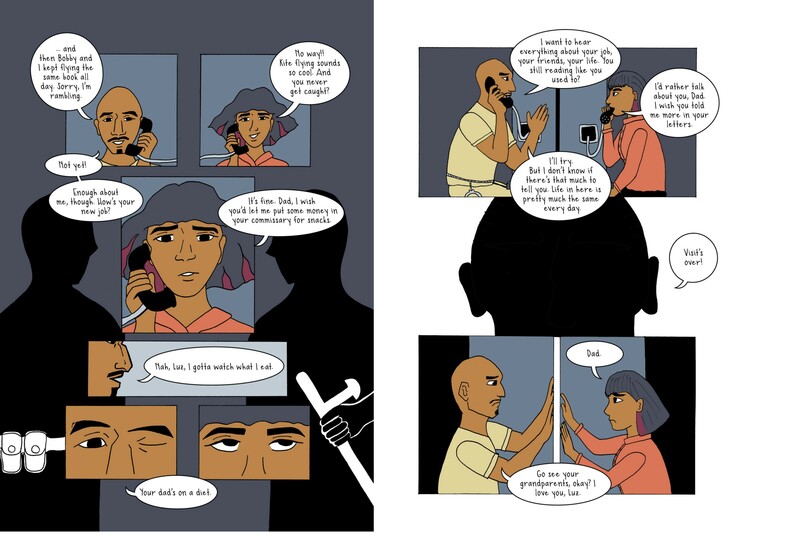 Our story follows Rodrigo as he joins the hunger strike, while also trying to repair his relationship with Luz, his daughter, who becomes a prison strike organizer with families on the outside. At this point, I should take a moment to say that I cannot draw. I know people say that all the time, but, honestly: my handwriting is illegible, my team always loses at Pictionary, and even my stick figures look as if someone has stepped on them. 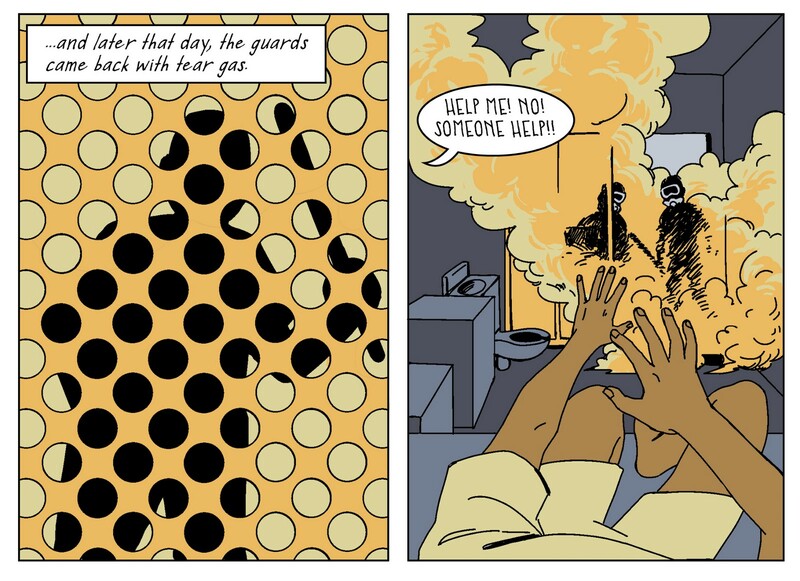 I was scared–terrified, even–to embark on the process of making a comic, but it turns out a great way to learn to do something is to do it collaboratively. We mapped our overall story arc and agreed on some major plot points, and then, to hash out the details of the story, we began thumbnailing scenes. 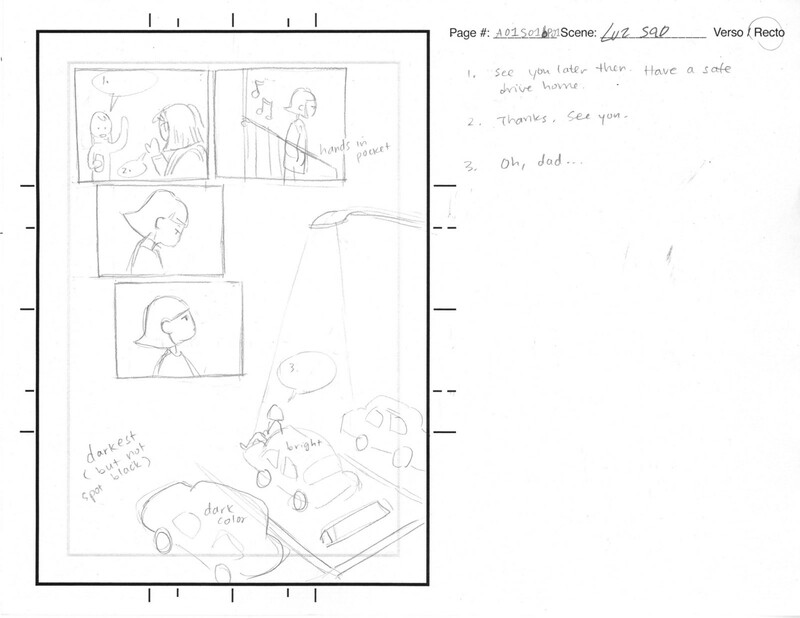 Thumbnails are basically draft pages: rough drawings (especially in my case) accompanied with ideas for dialogue and other text. As we thumbnailed, we continuously edited and refined our vision, and the story took shape: Rodrigo, after ten years in solitary and shaken by a rocky visit from Luz, would join the strike in an attempt to prove his worth. 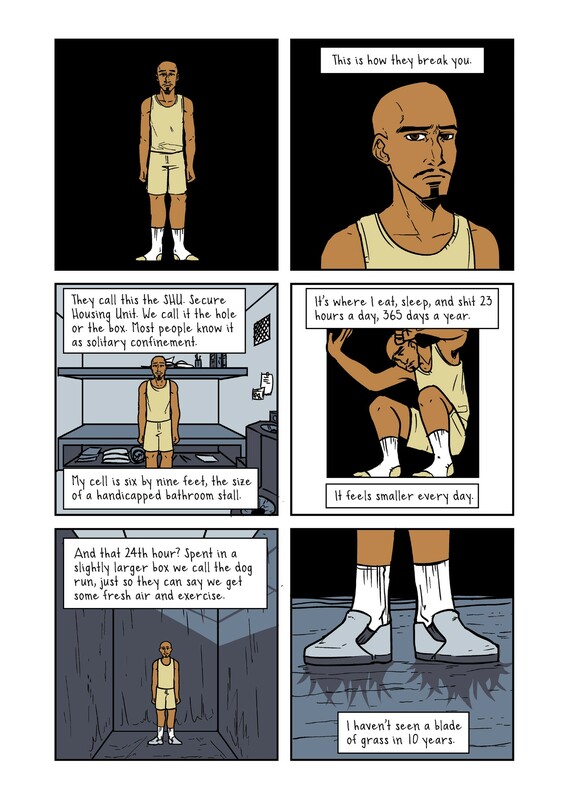 The characters around him build out the world of the prison, revealing the torturous conditions of solitary confinement (the UN does, in fact, consider solitary for any period longer than 15 days to be torture) and the struggle for improved prison conditions. That’s just about all I can say without giving away any spoilers. An edited thumbnail and final page. 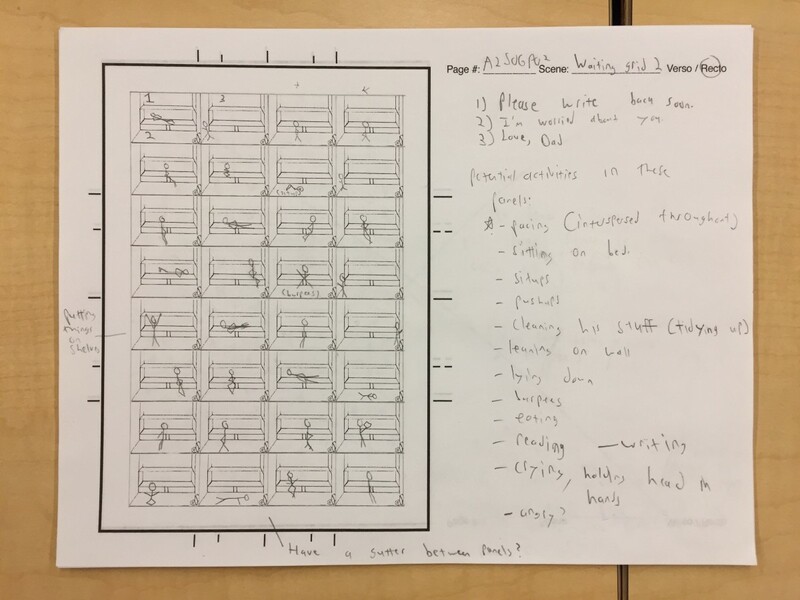 At the same time, some of the students created character turnarounds: sketches of each main character shown from all sides, so that each artist could check these visual references. This is common practice in the comics and cartooning world, and felt especially vital in this case considering ten or so people would be drawing each of these characters. 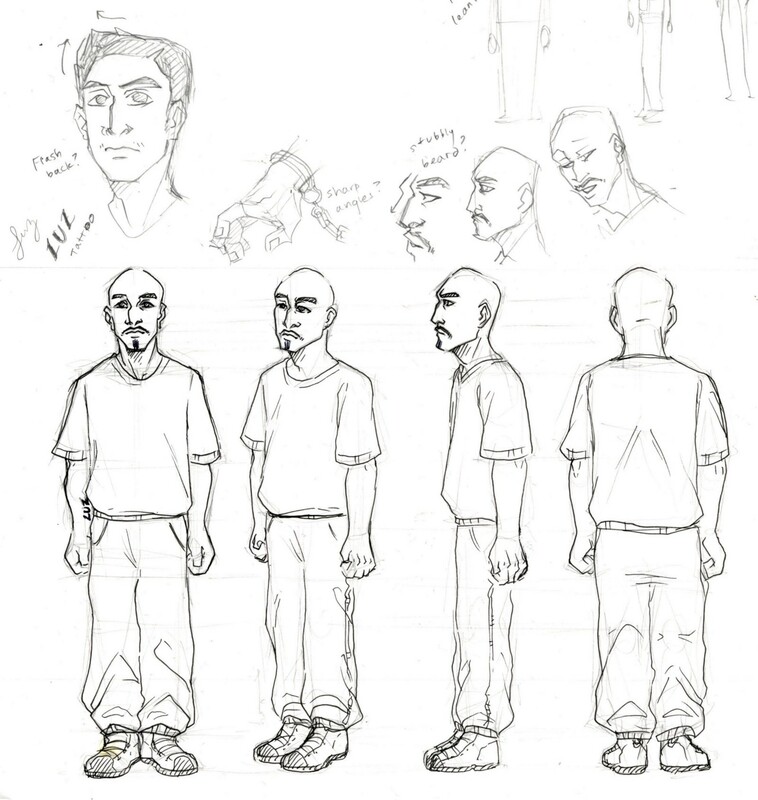 Character turnaround for Rodrigo Santiago. By the close of the fall quarter, students were turning thumbnails into inked pages, drawn either digitally, or by hand and then scanned. After winter break, we rushed to finish the inks, and then moved to coloring and then lettering the pages. Each of us did at least a little (and often a lot) of each task. Personally, my favorite part was editing and refining the narrative of our story, tinkering with dialogue and connecting the dots in our plot as new pages came in. The process of creating comics was demystified, yet no less magical, and somewhere in there my classmates and I realized we had done something that had once felt impossible: we moved from comics fan to comics writers. 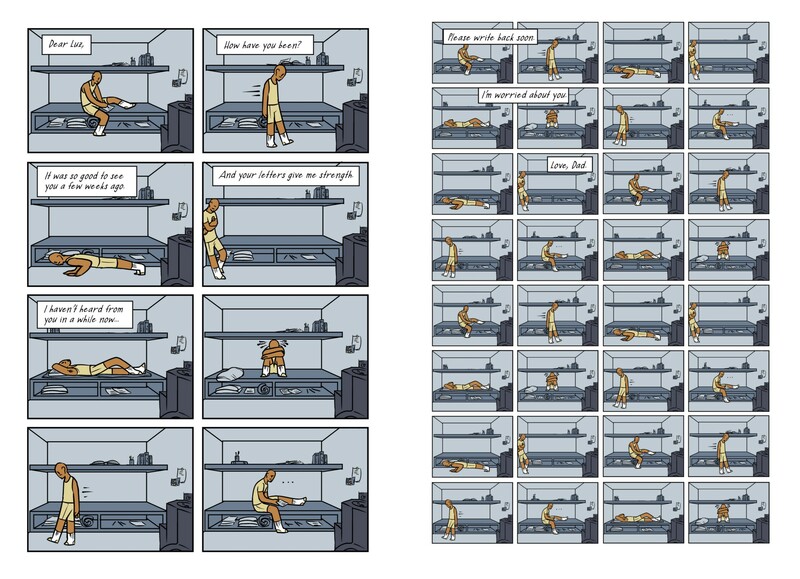 The sequence of a page: thumbnail (top), ink, scan, color, and final lettered page. We kept Luz saying, “Oh, dad…” from the original thumbnail until the later stages of editing, and then we realized the moment was more impactful in silence. Along the way, I thought about the process of collaborative creativity, and some of the lessons I’ve learned over the years that resurfaced in this project. I’ve pitched enough visual story ideas — and had enough initially rejected — to know that sometimes, when there’s a concept stuck in your head, you just have to show people in order to convince them. 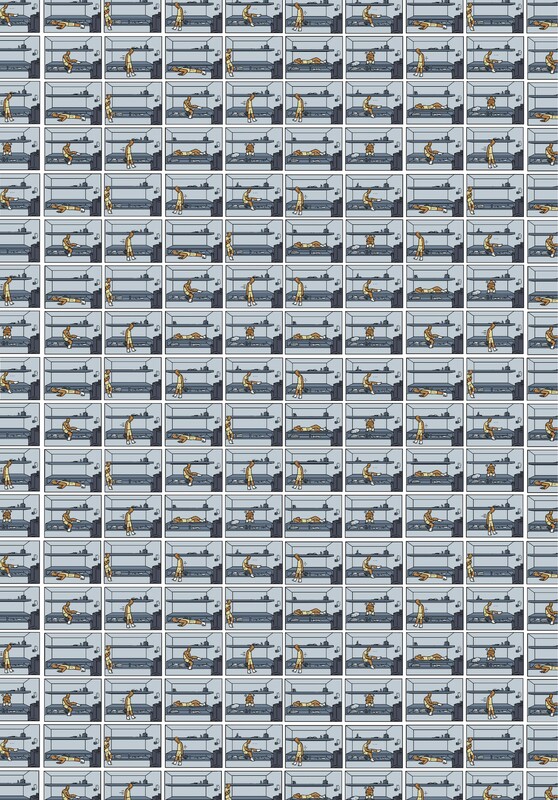 Early in the graphic novel process, I had an idea for a repeated image of the same prison cell, with Rodrigo in different positions in each frame, slowly zooming out. Over the span of a few pages, it would become a typology of the drudging monotony of solitary confinement (a monotony that research says has serious lasting mental health impact). When I tried to describe this to the class, I could see that it wasn’t quite landing. I had to show them. This time, I saw eyes light up as I flipped the pages. 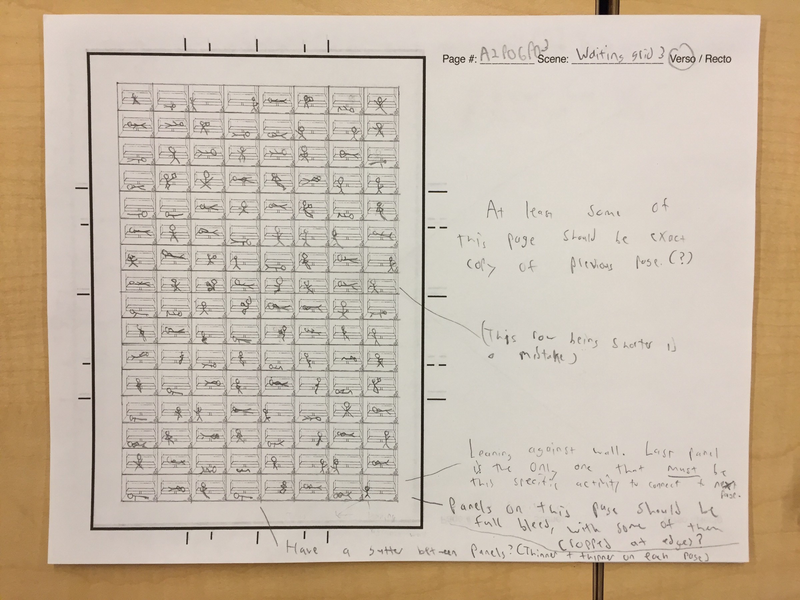 They got what I was going for, and “where will Peter’s grid go?” became a sort of running joke in the class as we fleshed out our story. Generally speaking, a good rule is that you should come up with a great story, and then tailor the images to the needs of that story; writing to fit a visual just because you like it is way too clunky. But this was one visual idea we had early that we kept in mind until we finally found a home for it: Rodrigo starting to lose it as he waits for a letter from his daughter after a long silence. In the early days of Everyday Africa (the viral, group photography project I am most known for) I and the other cofounder, Austin Merrill, felt a great deal of ownership over every aspect of it. It was our creation, and we felt like we had to do everything. It took a long time, but eventually we realized that after looking at the images ourselves for so long, occasionally sharing creative control with others could lead to new and unexpected outcomes. Handing off curation of an exhibition, for example, helped us to see the photography through fresh eyes. We’ve tried to let go since then, and to pass the creative wealth around as much as possible. When it was time to turn my thumbnail of the grid pages into a final, inked page, my initial impulse was to grab this one and draw it myself. Even though I “can’t draw”, I thought this was the one scene I should try to take ownership of. But, I realized, I was more excited to see what someone else would do with it. (And, to be honest, it wasn’t fully my decision; our teachers had a general rule that no one could ink a page they had thumbnailed.) The payoff was incredible; the final result both mine and not mine, all at once. The rest of the “if you love something, give it away” line is of course, “if it comes back, it’s yours”. This one did come back; I did some of the coloring and lettering on these pages. But it’s not mine anymore; it belongs to the whole class. As I write this, we’re in the final stages of editing our book. It’s a wild and chaotic process, each of us getting assigned pages to edit, working frantically to finish them on time, and then checking in as a group to see how the story hangs together with each set of changes. I can’t imagine doing this alone. Each of us picks up on something that another misses. Suddenly, someone reveals a newly colored page or freshly worded scene, and everything clicks for the rest of us. For all writers, there’s that moment when we give our work to someone else to be a second set of eyes, to make sure the story tracks. In this class, we get to be each other’s second read, working on different scenes and then handing them off to each other. In a more competitive atmosphere, I imagine us all kicking ourselves for every mistake caught (“why didn’t I think of that?”), but in this class, we’re relieved, elated, and thankful, knowing the final book will be much stronger. It saddens me to think that the next time I make a comic, it won’t be with this group of people. But there’s a real plus side to making comics when one is unable to draw: it will always be collaborative. I’ll always need at least one artist to work with. And I do plan for there to be a next time. I had a simple but powerful revelation while making this comic: unlike photography, you can miss the moment and still tell the story. I was thumbnailing a scene in which Rodrigo is tear gassed and beaten by the prison guards, and it hit me: this is the kind of thing you could never photograph, at least not without years of working relationships and fighting for access. But if this story had come directly from a journalistic interview, then telling it in comic book form would be no less true than a written story. I look forward to applying these ideas to my own work and the themes I’ve been reporting on for years. I’ve already begun mining old notes and photographs, digging up stories of some of the remarkable people I’ve met in my career — stories that always felt incomplete when told with just a single image. The first step in trying to make new things, it turns out, is to jump in. The curtain is pulled back. The tricks are revealed. And now that I’ve finally learned the magic of comics, I know it will be more than just my favorite way of reading stories: it will also be one more way that I tell them. Many thanks to the students I was fortunate to collaborate with: Elena Kamas, Candice Kim, Katherine Liu, Lily Nilipour, Danial Shadmany, Sarah Shourd, Sharon Tran, Nik Wesson, Serena Zhang, and Lucy Zhu; to our teaching assistants Luke Soon-Shiong and Bae; and to our instructors Scott Hutchins, Shimon Tanaka, and Andy Warner. Tuesdays and Thursdays will never feel the same. Photographer. Cofounder @everydayafrica @evdayprojects. 2018–2019 @JSKstanford fellow. 2018 @pulitzercenter grantee + @THSEA artist.